Only in a communist's dreams or a textbook would you find the Name-Your-Own-Price (NYOP) principle. In the real world, though, where people like us are trying to build actual sustainable businesses, determining the correct price turns out to be the most dangerous pitfall of all. Whether you're selling a brand replica on eBay or a brand-new and unique SaaS service — it has got to be priced just right. In my experience, going with what your (or your CEO's) gut tells you it should be is hardly scientific. Identifying the right price point is all but impossible without running a series of experiments. However, you still need a starting point. Today I'm going to share with you some of my fool-proof principles that will help you on your way. There a lot of different kinds of businesses out there. Some have production costs for each product they make, others have commission fees, and then there are those who have to push ancillary services (like support, maintenance, and warranty) to keep the company afloat. All of these specifics cannot be covered by a single universal formula, but the common principle is this: your price should not contradict common sense and your basic business model. A venture capitalist is walking down the street and he sees a startup CEO. The CEO is holding a sign that says: "Will exchange your ¢50 coins for $1 bills". — Wait, how are you generating profit? — Profit? — the guy replies, — I'm not sure about the profit yet, but look at that revenue! Don't be that guy. Be mindful of what is it that drives your bottom line. There are some rare occasions where the rule does not apply. For example, when you're sacrificing revenue by means of lowering prices to gain a bigger market share (aka «predatory pricing»). This strategy is often used by startups sustained by venture capital because it's done with their blessing and for the sake of future profits. When you were starting out, you've probably done your due diligence and studied the competition. The field you were entering most probably didn't form overnight. Knowing your competition, their USPs and prices are incredibly valuable. After all, you probably share the customer pool and some of those people might want to migrate to your business. Wouldn't it be a shame if they got repelled by your prices? Important note: If you don't have competition and you're creating a brand-new market or the market you're entering does not yet have a clear leader, price experimentation gains particular importance. Category creation gives you an opportunity to identify that cornerstone price that everyone else is going to try and match in the future. Most people are afraid of setting the price too high. Don't be. The worst thing that can happen is you'd lose a portion of your conversions, that's it. You can always go lower, which would be good news for your clients. Raising the price, however, is another story. Another important factor people tend to forget about is sales and discounts. If your product tends to retain users, a simply triggered discount will help you push a user towards a purchase by lowering the price only slightly. 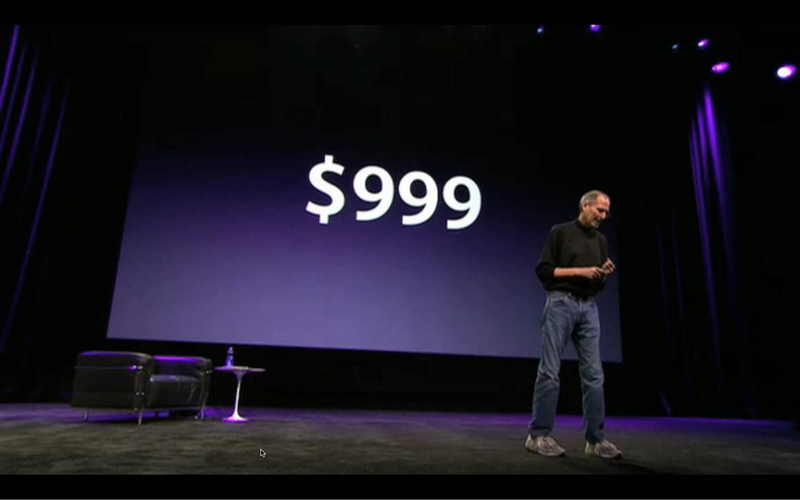 Steve Jobs announcing the start of sales for the first iPad. It's unlikely that the price was chosen at random. In a nutshell, the left portion of the price should be as low as possible. If you're choosing between $1000 and $1100, go with $999. This may sound super basic and commonplace, but studies show that that sort of pricing is indeed what people perceive to be most lucrative. There's even a term for that — Charm Pricing. App Store will even do it for you, while Google Play and the rest of the market gives you free range. The most important takeaway here is this: prices are not set in stone. Until you've captured the public's attention, there's no need to stick to the same price. And even then, you still can hold some experiments. 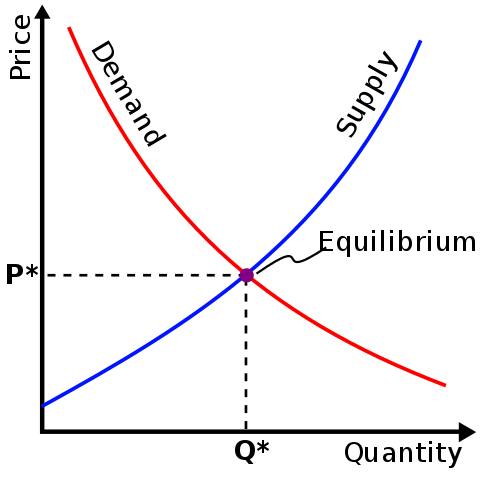 With each attempt at lowering the price, you'll be traveling along the supply-demand curve. Your initial price may not immediately hit equilibrium — the spot that would make the most economic sense to your business. There are steps you can take to find your way to that point of equilibrium. However, if your business is offline-first or it's in the b2b sector, those won't work for you. But if you're in charge of an online b2c service, buckle up - you're in for a ride. Once you've picked your baseline price, you need to figure out where to go from there. I must warn you: it's not going to be an easy journey. First, we need to choose whether to go up or down. That's when we should hold an experiment comparing our price both with the higher and the lower option. Either one can turn out to be a winner. Keep in mind that your goal is not to get the most out of each client, but to get more money overall. At the end of this experiment, you should be able to identify a price range that could potentially generate the most profit for the business. Not that you won't need to make a single change to the product itself, you'll just start getting a larger profit for what was already on offer. This part of the process is more of an art than a science. Suppose our long experimentation process helped us identify the perfect price. But that's just an average! Our next step is to break down the user-base into segments and experiment with those individually. That's what we call dynamic pricing. We're not suggesting you use hundreds of segments or an ML-algorithm that picks the right price based on a user's star sign and their typing patterns, but certain basic and more obvious groupings can actually be quite beneficial. I suggest you consider your product first. Perhaps, its very nature already allows for a natural division of users into segments. Is your product equally popular in the US as it is in India? Do you have a steady stream of organic traffic that generates close to no revenue and a smaller purchased traffic that's responsible for the lion's share of your income? We have a product. It's popular with users from Russia, most of Europe and Brazil. The price has always been the same for all and it's remained unchanged for years. The question was: can our German clients afford to pay more than the users from Belorussia? According to Wikipedia, these countries are 70 spots apart on the GDP per capita ranking list. That's an almost x10 difference in absolute values! We're not saying all Germans are 10 times richer than the Belorussians, but that information is reason enough to suspect that if try and offer them a higher price we're going to turn out a bigger profit. We matched up the list of countries our product is popular in with the top-30 counties with the highest GDP. The list was rather short: the USA, Australia, Canada, Germany, France, the UK, Italy, and Spain. We then proceeded to assign an x2 price-tag for users from those countries. We updated the app, having created 2 control groups and 1 test one. The experiment was a long one. We run a subscription-based business, so we had to wait at least 2 full months to get any data on subscription renewal. The results were so staggering that we couldn't believe our eyes and had to repeat the experiment. The results were the same. We doubled the ARPU over those 2 months without changing a thing about the product itself, our internal or external marketing. It's important to understand that holding an experiment like that is actually rather fussy. You need to keep the sales pages and marketing materials consistent with current pricing, otherwise, you'll have a disaster on your hands. Managing the experiment is also quite complicated as you need to keep track of all the user groups with all their varied pricing. But the potential result is worth all the trouble.